The Master’s House was originally built between 1487 and 1488. A period of major renovation took place about one hundred years later. The Master of St Katherine’s Hospital at this time was Edward Cowper (pronounced Cooper). He kept meticulous accounts of the renovations here in Ledbury, which cover a twelve year period from 1584 to 1595. The accounts were inspected every year by the Dean and at least two members of the Chapter of Hereford Cathedral, who were the patrons of St Katherine’s Hospital. This annual visitation took place at Michaelmas, 29 September, each year and sadly Edward Cowper died in July 1596, two months short of another year of accounts. These accounts, which today are held in the Hereford Cathedral Archive, are beautifully written, listing not only the work done and materials used, but also the names and trades of the local men who Master Cowper employed to undertake the work at St Katherine’s. He also listed the costs incurred for materials, and where they came from, in addition to the wages paid, and the payments made for lodgings and food for specialist workers who came from further afield. An examination of the parish registers, which listed baptisms, marriages and burials from 1556 onwards, has allowed the names of the tradesmen’s wives and children to be found, in addition to those of some of Ledbury’s more prosperous inhabitants. The vicar’s Tithe Book, now in Hereford Record Office, provided a street by street list of townspeople, including the Master’s workmen. Apart from the tradesmen, who had served apprenticeships to learn their trade, there were a number of labourers who assisted them. James Merrick was a labourer, living in Horse Lane (now called Worcester Road), who later moved to New Street. He assisted John Morris, another young labourer from New Street, in carrying stones and mortar for the masons and later in October 1593 in applying clay to the wattle and daub infill of the millhouse walls. 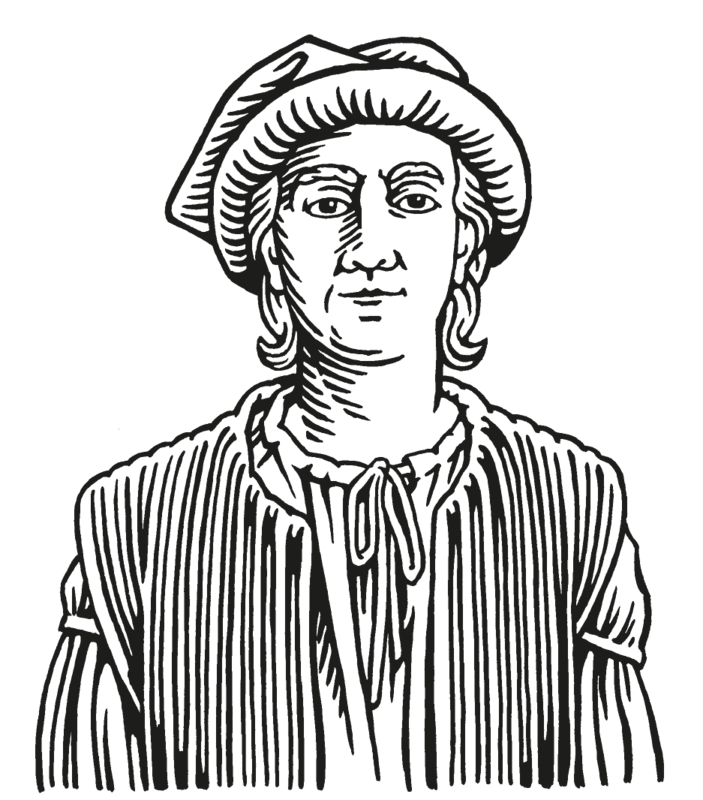 Emanuel Podmer was a labourer who lived at Dunbridge, on the Gloucester road, with his family, wife Alice and daughter Joan; their other daughter Elizabeth had died soon after birth in 1580. Emanuel assisted Jim Stafford the gardener with fencing, cleaning out the hospital pool and other work around the site. Edward Cowper’s accounts tell us about all the work done for St Katherine’s. What follows below relates specifically to the Master’s House. Four oak trees from Teddeswood were bought from Mr Rudhall, at a cost of 43 shillings (£2 15p), and were used to make the wainscoting (oak panelling), a table and some stools for the parlour, in May 1585. An additional tree costing another 12 shillings (60p), had to be bought only three weeks later to complete the job. 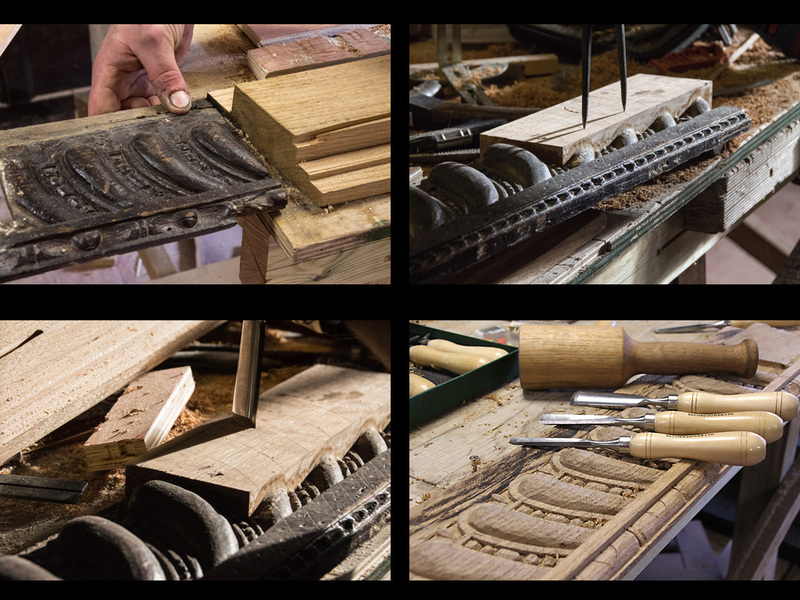 Other furniture, including dressers, cupboards and shelves for the Master’s House was made over the next few years. Cupboards set into the wall of the parlour and in the bedchamber above were made in September 1586. Galleries had been under construction in 1584 and work continued over several years, including making new windows, which had metal casements (opening sections), inserted at each end of the hall. The galleries were created by extending the upper floors in both solar and service wings over each end bay of the hall, so that anyone upstairs could step onto the gallery floor and look down on what was happening in the hall below, without the need to run down stairs every time. These galleries were later walled in to create an extra room at the solar end upstairs and a corridor added to access the bedchambers above the pantry and buttery in the service wing. During the modern day restorations, nothing was found of the galleries except for this mention made in Edward Cowper’s accounts. 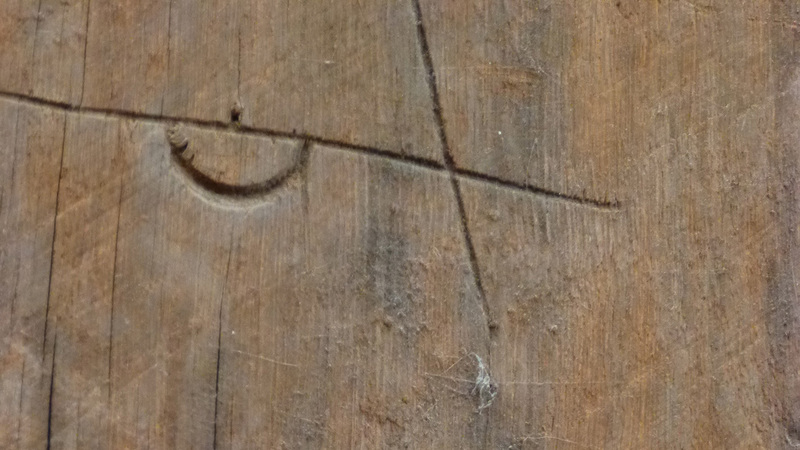 The only sign of that those galleries existed is where the ends of the beams, which were inserted to support the gallery floor at the west end of the hall, were cut into the painted beam. At the other end of the hall, the glass floored corridor, now leading to the John Masefield Archive and Victoria County History rooms upstairs in the service wing gives some idea of how the galleries would have looked, although they seem to have been made with solid panels of wattle and daub, rather than a row of posts topped by a rail. The ‘panelled room’ in Tudor times, seems to have been divided with the master’s parlour, separated from a narrower service room on the north (colder) side. The old original chimneys in both parlour and the Master’s bedchamber above were demolished and new ones built in stone, complete with new brick firebacks and a stonework surround in the parlour to protect the new wainscoting from the fire. This new fireplace was centrally positioned on the western wall of the Master’s parlour. It now appears offset, because the service room now forms part of what today is called the panelled room. 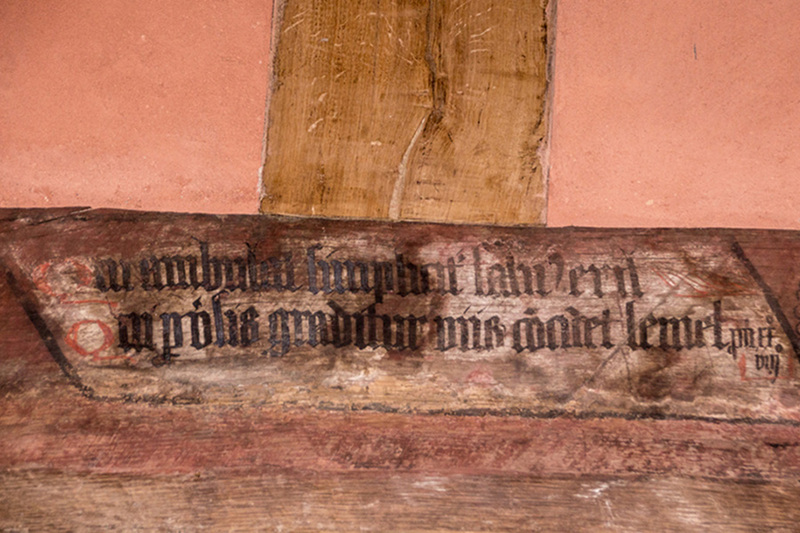 Edward Cowper left his mark on this fireplace with his initials and the date carved into the panelling frieze, which at that time would have been placed about chest high, with a type of ornamental plastering, called pargeting, above the wainscoting, which may have been coloured with ox-blood or whitewashed. New staircases were also built at this time, together with all the associated carpentry and plastering involved. New doorways were created and old unused ones stopped up, by simply closing the doors and plastering over them. The new parlour door had studs applied to it as well as bolts, locks and keys for security. Edward Cowper made sure that the old original windows with their wooden shutters were replaced with new window frames, which were glazed with leaded windows, some of which had casements, the opening sections of metal frames, supplied by the town’s smiths. The security of the buttery and larder/pantry in the service wing was also dealt with. The smiths were kept busy supplying hinges for windows, doors and cupboards, locks and keys for both new and old doors, including for the cupboards. Some of this ironmongery has survived and can be found in The Master’s House model unit drawers. 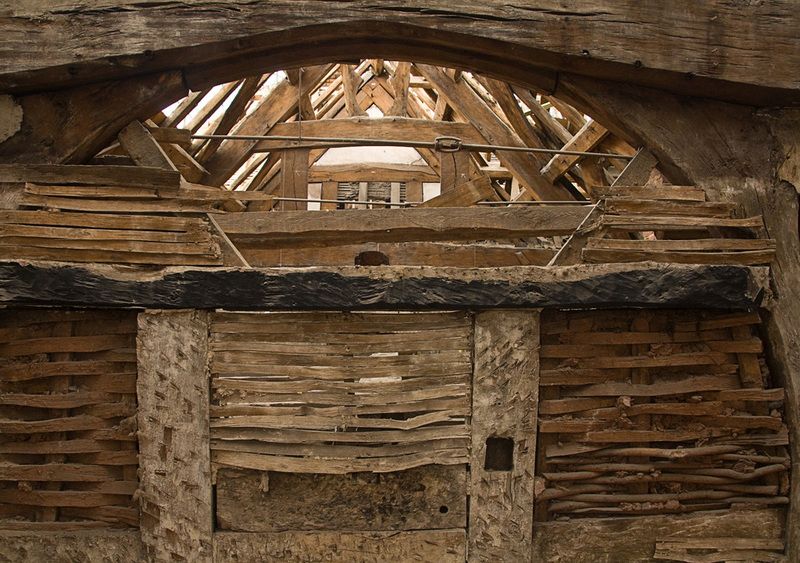 Staples, latches and catches were also supplied, and a multitude of nails of many types, even stone nails, which were used when The Master’s House roof was retiled with tile stones à la Cotswolds.